Each year Teams India donates money to purchase new sewing machines for the graduates of Cherial Bible School for Women. These young women have completed four or five years of Bible training and some have made the choice to continue in their Christian education despite the fact it may ruin their chances for marriage. There are few Christian men available and few willing to wait for their wives to complete a course of serious Bible study. So these young women are taught to sew marketable garments—classes in “stitchery” at the same time they learn to understand and prepare to teach the Bible to local women and children. This year there were four graduates who received a sewing machine each. 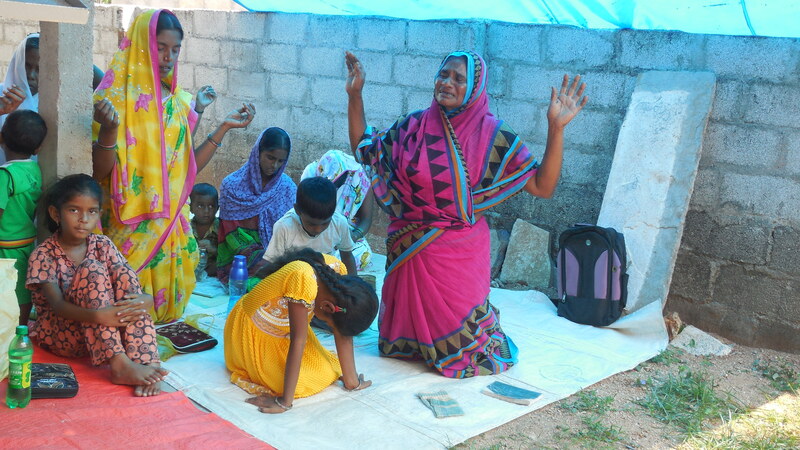 The red-haired woman in the photo is Susie Reddy who, along with her husband, Dhanu, oversee the Bible College. Susie’s parents were life-long missionaries to India so Susie has lived there all her life. She and Dhanu also have worked to establish churches and training programs for couples who will be house church planters. They have been instrumental in developing an English speaking component of the Indian Mission School in Peddipalli. Teams India is proud to take a small part in encouraging the good work of the Gospel in simple projects such as providing these sewing machines. They provide a means for women to begin small businesses to make a living while they serve the Lord. While the children in the U.S. are looking forward to their summer vacation, the kids in India are getting ready to begin a new year of school in June. Actually they switch from their old grade (standard) in April, then take a break during the hot season of the year. In June they continue their school year which goes until the following April. Right now is the hottest season of the year in India. We heard a report that the temperatures were reaching the mid 120’s yesterday and many, many of the young and old die during this time. We can pray for an early monsoon to cool the temperatures all across the country. Teams India has supported the education of one of our ministry families for many years. For security reasons we won’t name the family at this time, but they have three children and are from the Banjara (Gypsy) people of India. Many believe the gypsies of India are the original gypsy people who spread all across Asia and Europe. All three of the children in this family are excellent students. But for low caste or tribal people there aren’t good schools available without paying high fees. We undertook to put the children in mid-level schools and then, when we saw their potential, moved them to state schools. The eldest daughter just completed her first year of medical school and did very well. She will be one of the first doctors from the Banjara tribe. Families living in their area are beginning to ask how their children have achieved so much and how they can really learn rather than just sitting in rows in their poor government schools. They want to know how to help their children study. The other two children are beginning the 8th and 10th standards. They excel in their state schools and study long hours each day. They, too, have their sights set on college educations. 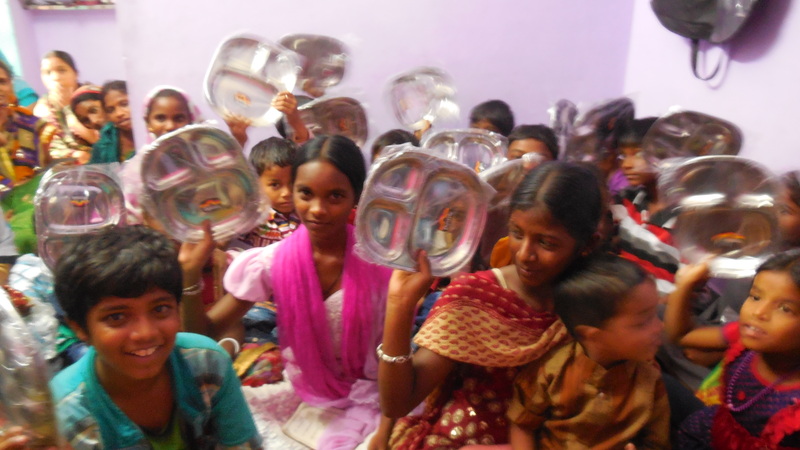 Recently we had need of funding for these children and the Lord answered our prayers. We are so grateful to those who responded with financial gifts when the needs were made known. Thank you. Sampath and Uma have been working tirelessly to build house churches in their area. They also have an agency registered with local government officials called Care and Concern which offers practical help to local villagers. In addition, they house fourteen young people in their own home while they await the funds to build a new and larger home. Recently Teams India was able to release funds to Sampath and Uma to dig a much-needed new well on their property. It was put in just in time to provide water to their guests who attended a two day seminar for local pastors to build and encourage one another. Several pastors brought messages on such topics as victory, truth and freedom from a life of worry. They studied, prayed and fellowshipped together for two days. In a time when India’s believers are often under persecution, this was a wonderful time of encouragement for the Christian leaders and their families. When Roger first met Uma she was a resident in an orphanage outside of Hyderabad. She had lived there since she was five years old. Her mother had been killed by her father, the father disappeared and a local pastor rescued the young girl from her home. He knew the orphanage would care for her. Over the years Uma grew in her abilities to lead. She taught the younger girls, led worship meetings and acted as an assistant to the directors of the orphanage. She attended a local college for several years and took part in a YWAM training in Puna for four months where she met the man she would marry. Uma and Sampath were married and moved north to Karimnagar district where they have been planting churches, leading Bible studies and gathering children without homes in a mini-orphanage. They currently have two children of their own and fourteen orphan children living with them. Uma teaches in a local school, oversees the life of the large “family” and together they distribute food, clothing and medical supplies to local people in need. They oversee six house churches scattered in local villages. Uma’s heart’s desire has always been to have her own orphanage. Uma and Sampath have a critical need of a new home as the structure they currently live in is literally falling down. Teams India hopes to help Uma and Sampath continue their ministry and provide them with a new living structure. Let’s help Uma achieve her dream. Roger began visiting India years before I did. My first visit came at Christmastime. Of course the weather was warm in most of the country and Roger played a very jovial Santa in Delhi at Rodrick’s home. I marvelled at the contrasts in the things I saw. The vibrant colors of clothing and flowers next to piles of burning garbage. The little children, hair in tangles and filthy, begging alongside the streets while swarms of people, cars, bicycles, pedi-cabs and even bullock carts swept by them. Shops that had cows roaming inside and mice skittering over my feet as I entered. The sights, smells–the overwhelming feel of being in an unknown land has never left me. Yet I love India. I focus on the people– their smiling faces, their joy in everyday life, the simplicity with which they face each day. It’s a difficult time in India for Christians. The government in power is very anti-Christian, and especially opposed to conversions. Anti-Christian groups believe it’s wrong to change a person’s belief so it takes a great deal of courage to stand and continue ministry when churches are being bombed, pastors attacked and even killed. The contrasts between India and the U.S. speak most loudly to me when I first come home from a visit. Everything here seems perfect. Everything is clean and bright. My home seems like a palace. Then I have my first meal in a restaurant and my heart sinks when I realize we could have fed a family for a month with the money we just paid for one meal. The longer I stay away from India the dimmer the memories become. But the needs are very real. There is so much that can be done with a small amount of money. Teams India helps support husband and wife church planting teams who both preach the Gospel and help to feed and educate the poor. The work is never done and what we do is never enough…but it’s something. My friend, Grace, is a widow herself and in poor health, but she serves women and children every day because she loves the Lord. Bilahi in Assam was loaned out as a servant as a child. Her family was so poor there was never enough food and little clothing. Yet she travels by bicycle to 74 churches spreading the love of God. She’s willing to give everything she has for her faith in God. The Lord spoke about sheep and goats. He said, “Come you who are blessed by my Father; take your inheritance, the kingdom prepared for you. For I was hungry and you gave me something to eat, I was thirsty and you gave me something to drink. …I tell you the truth, whatever you did for one of the least of these brothers of mine, you did for me.” (Matt. 25) So we rejoice to be able to give to the poor even though our offerings are small. It’s good to be a sheep. Come, join us. Even a small gift makes a big difference. This building in Allahabad, India may not look like much, but to eighty orphans in temporary housing after being evicted from their former home, it looks like hope. The building is a former parsonage and has been deemed a national heritage site. It can’t be taken down, so it needs major internal restoration to be safe. The eighty girls are shepherded and taught by Sister Sheeba, a woman who has devoted her life to caring for the needy. While they wait for this building to be restored a wonderful Christian man is paying for the temporary housing out of his own pocket. But he can’t do this on an ongoing basis. 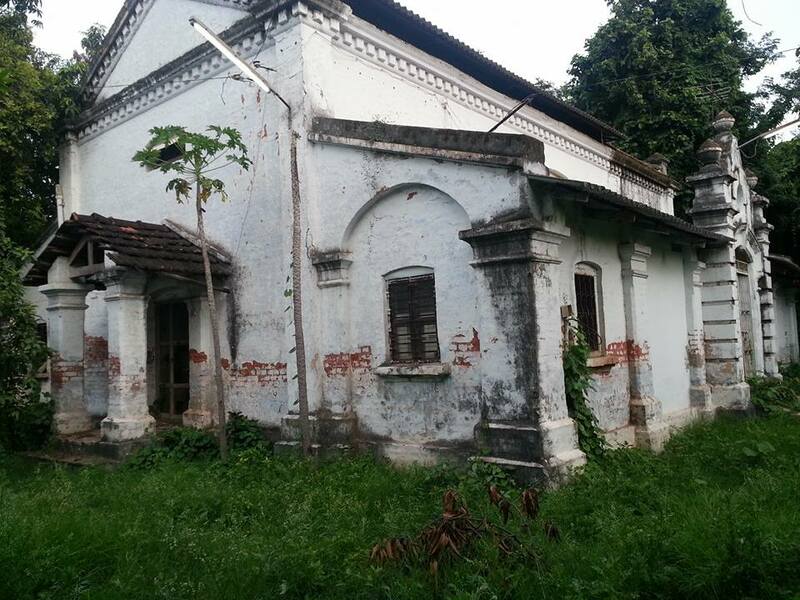 It will cost quite a lot to restore this building, and then a Canadian Missions organization has a long-range plan to build a beautiful new home to house up to 150 girls. But that will take years. These girls need a home right now. Can you find it in your heart to give? If so, use the paypal button and mention Allahabad Girls. In 2009 Roger and I spent three weeks at a training center near the city of Hyderabad. At that time fourteen women were completing six months of training in both evangelism and in working with women in a wide variety of programs. These women were recommended by their pastors as those able and willing to learn. Since that time Teams India has been able to help two of the fourteen women in very practical ways. Bilahi Daimari, the woman on the left lives in northern India in the state of Assam. She is an itinerant worker, riding her bicycle year round to villages where she teaches and ministers to women and children. She lives a very humble life and has written to thank us for our help. Using the funds she has been able to add a room to her brother’s home, giving her a place to live. Until that time she was not welcome in her brother’s home and suffered a great deal. 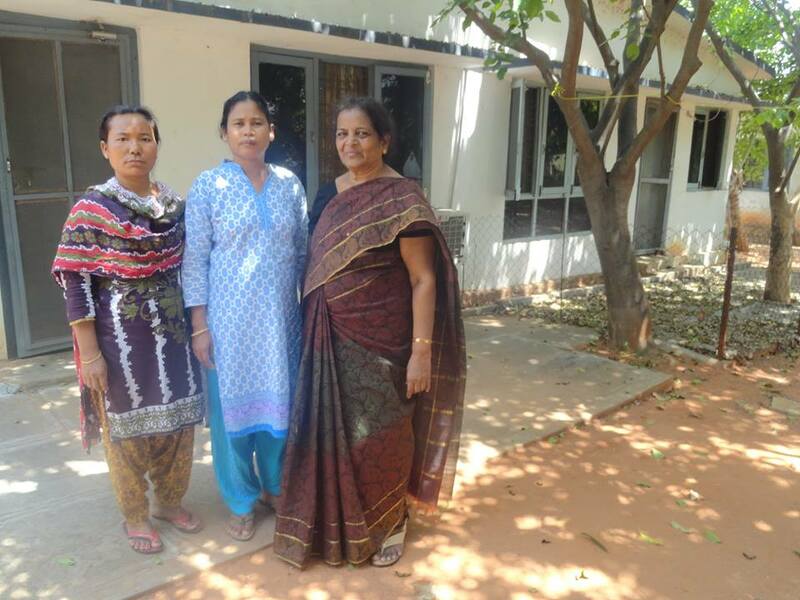 The woman on the right is Grace Jogal, working in Hubli, Karnataka in south India. She continues to do wonderful work with groups of women and children in very poor villages some distance from Hubli. Grace helps women through savings groups to begin small businesses. She also teaches women to sew, to make candles, and to make various kinds of inexpensive cleaning products. She occasionally runs medical clinics and women’s seminars on simple things such as hygiene, purposeful living, parenting and more. This picture was taken at a reunion at the training center where they’re celebrating thirty years of service. The women have been commissioned to return to their home areas and do research on indigenous groups nearby. The training center then works with them to develop plans to reach the groups with the Good News of Christ. I’m constantly amazed that Teams is able to be part of such amazing work and that we’ve built a partnership with such wonderful women. Grace has written an extensive plan with goals for future work and with the financial requirements to build her ministry. If you are interested in seeing her report of the work accomplished in the last year, add a comment and I’ll make that available to you. This picture shows young girls from a village in Piplantri, an area in Rajastan, India. Something remarkable has been happening here since 2007. The village has begun the practice of celebrating the birth of girls–something unheard of before that time. When a girl is born in Piplantri the village plants 111 trees. In addition the family receives a village donation of 21,000 rupees which is put in a fixed bank account until the girl turns 20. At that age she may use the money for her education. The parents sign a promissory note that they will not marry her before that time. Besides changing the attitude toward the birth of a girl baby which in the past was seen as unlucky, a curse, an unwanted expense to the family, the whole area is thriving financially. 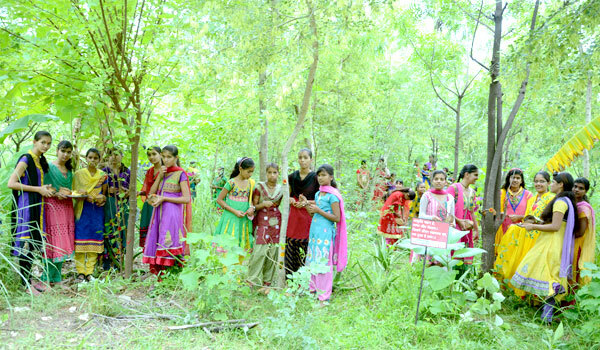 To protect the young seedling trees from insect damage, the village has planted thousands of aloe plants. In turn, these plants have been marketed for medicinal purposes, bringing in much needed revenue for the village. The work of planting and tending the trees and plants has provided much-needed jobs for the area. It’s a win-win for the village and a miracle in terms of the attitudes toward young girls and women. India has presented the Nirmal Gram Award for Cleanliness to Piplantri. Crime has decreased due to a better job market and villagers are proud of what they’ve accomplished. The practice of celebrating the birth of baby girls is spreading in the area. Perhaps one day there will be no more female infanticide. Good swallows evil. Light overcomes darkness. This is a photo from a few years back of the infamous Boys Club. Just take a look at those faces and you’ll see what I mean. 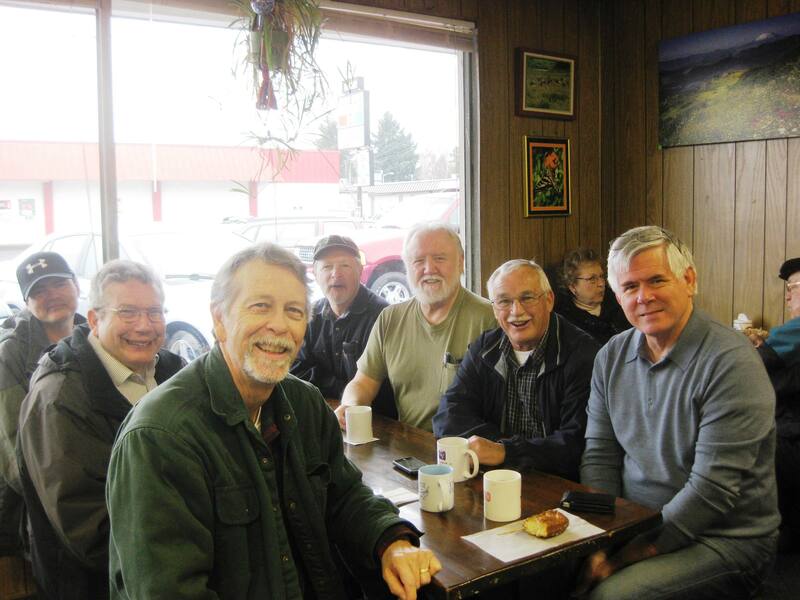 These guys meet regularly for breakfast and prayer and to mutually support one another. Right in front you’ll recognize Mike Monson, our good friend who died just two years ago. It seems like Mike just walked in our door for a cup of coffee and to watch tv with us. We miss his ready smile and wry sense of humor. Mostly we just miss him. I told Roger yesterday that Mike was a perfect example of the way God can change a person once they “get it.” Once we begin to learn that our life has purpose and that we’re given gifts and abilities to do some good in this sorry world, we see with new eyes. There’s work to be done and fun to be had along the way. Before Mike died we promised him we’d continue to support the work of Russal and Kumari of the Baby Girl’s Home in South India. That’s the ministry Mike found when searching for someone who cared about the rampant murder of baby girls in India. Russal and Kumari have rescued fourteen beautiful little girls from death at the hands of their own parents. Baby girls are seen as curses– an unwanted expense to the family. Recently Russal was able to enroll all ten of the older girls in a good school. Up to this point the better schools would not take them because they lack proper birth certificates. The new school costs about $900 per year per child which is triple what they had been paying. Sadly a good education is not free in India. Let’s honor Mike’s memory by helping to get all ten girls into school this year. They will begin their new school year in April. Let’s invest in life and overturning the godless practice of female infanticide one child at a time. Go to http://www.girlbabyhome.com. Your donations are tax deductible.